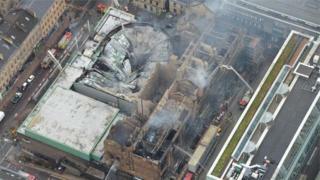 Glasgow’s Mackintosh building will definitely be rebuilt, according to Muriel Gray, chairwoman of the school’s board. But Ms Gray, a former student at the school, told BBC Scotland it would be rebuilt as a working art school, saying that was “non negotiable”. “There is absolutely no way it wouldn’t be a working art school. It’s non negotiable. Francis McKee, director of the Glasgow’s Centre for Contemporary Arts, which has been inaccessible since the fire, said a toilet in the building had been leaking for three months which had brought down the ceiling of a gallery below.